Lundin Petroleum AB (Lundin Petroleum) has announced that its wholly owned subsidiary Lundin Norway AS (Lundin Norway), as operator has agreed the final investment decision to proceed with an extended well test (EWT) on the Rolvsnes weathered and fractured basement discovery on the Utsira High. The Rolvsnes oil discovery is located in PL338C on the southern side of the Edvard Grieg field and is a fractured and weathered granite basement reservoir. During 2018, the successful drilling and testing of a horizontal appraisal well (16/1-28) was completed, which flowed 7000 bpd demonstrating good reservoir productivity and resulting in an increase in the Rolvsnes resource range, to between 14 – 78 million boe gross. 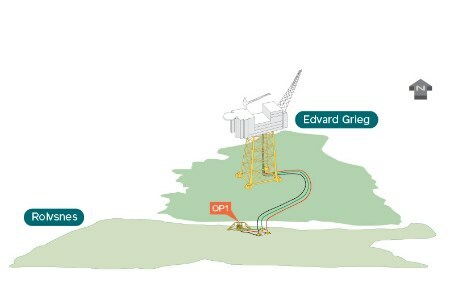 The Rolvsnes EWT will be conducted through a 3 km subsea tie-back of the existing Rolvsnes horizontal well to the Edvard Grieg platform, with first oil scheduled in 2Q21. The project will be implemented together with the Solveig project to take advantage of contracting and implementation synergies. This reservoir type has not previously been developed in Norway, although it has been developed successfully elsewhere in the world, and an EWT on Rolvsnes is required to better understand the long-term reservoir performance. To further assess the potential of the basement trend on the Utsira High, an exploration well will be drilled on the Goddo prospect located in the adjacent PL815 licence in 2019. The combined Rolvsnes and Goddo prospective area is estimated to contain gross potential resources of more than 250 million boe. The strategic acquisition of Lime Petroleum’s interest in the Rolvsnes/Goddo area was agreed in January 2019 and following completion of this acquisition, which is anticipated in mid-2019, Lundin Norway will hold an 80% operated working interest in PL338C/PL338E, with the remaining interest held by OMV. Further, in PL815 (Goddo) Lundin Norway will hold a 60% operated working interest, with the partners Concedo and Petoro with 20% interest each.